Would you look at that? 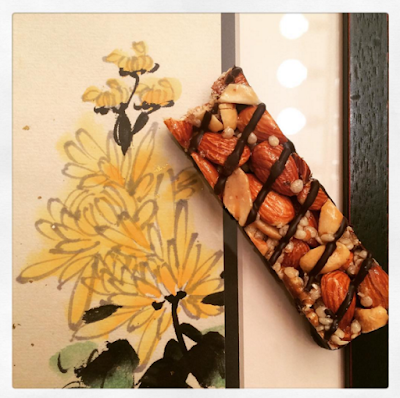 It's framed art and an energy bar. It's the very energy bar I was eating for breakfast. I don't want to brag, but that was a healthy breakfast choice, complete with protein and little fat and sweetness for the sake of satiety. I also don't want to brag about this next thing, but I'll just go ahead and share that I brought my current events magazines to school in order to catch up. I'm reading bits and pieces here and there. And, I hate to toot my own horn, but I'll just quickly mention that I made an appointment for next week and promptly recorded it in my planner. I'm just saying - and I only bring it up because it seems apropos of this #TwinTuesday pairing - that I'm pretty on top of things. Bring it and brag it. Yes!